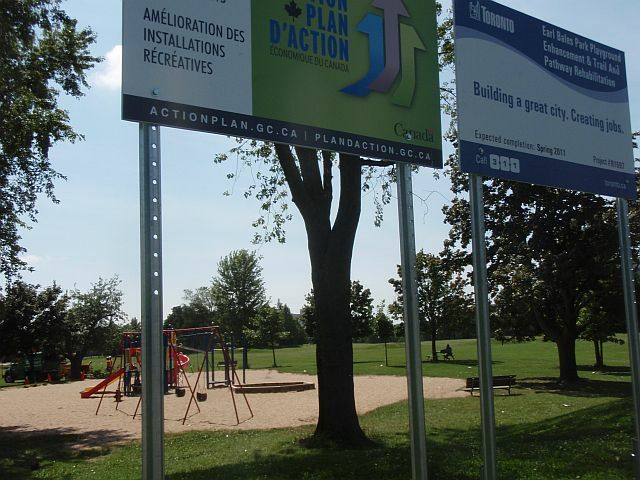 Recreational Infrastructure Canada (RInC) Program: playground projects in Toronto. 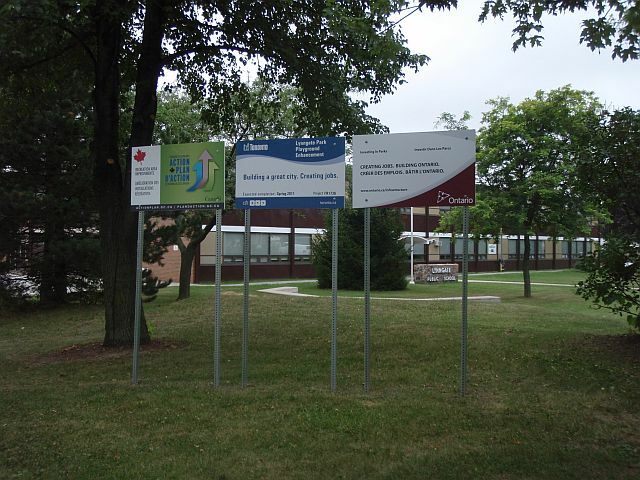 See also 1999 inspection reports and playground library. Twenty-four playgrounds in Toronto parks were put on a list for $100,000 make-overs, with Stimulus funds. Some were obviously in need of better equipment, or at least basic maintenance. Others were a puzzle -- why remove good, solid equipment and replace it with new structures? 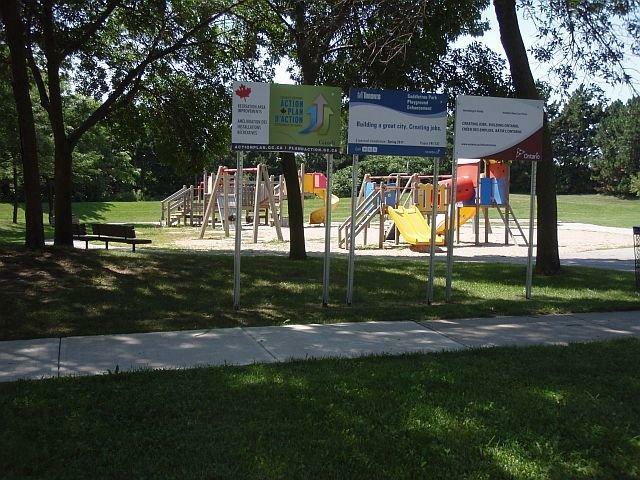 Beyond that, most of the refurbished playgrounds still lack shade and washrooms, and therefore, they miss the chance of becoming community social spaces. 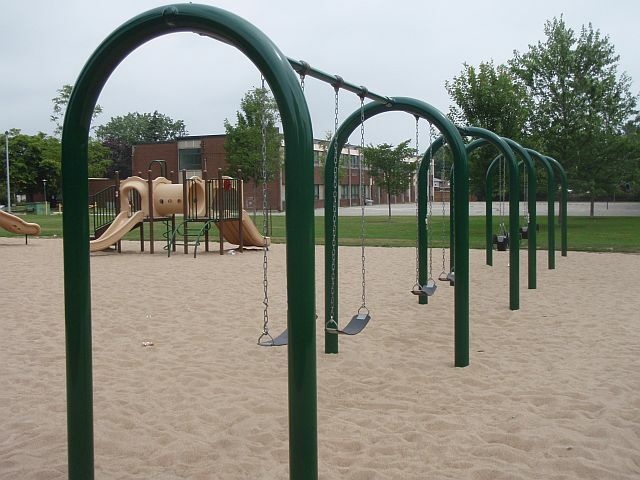 Here is an inventory of these Stimulus-funded playgrounds, including their maintenance history (often incomplete, since "freedom of information" requests turned up scant information). Also, here is a link to some specific problems relating to the Stimulus Funds applications and how they are carried out. 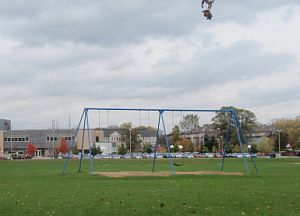 This playground is in a very large park that's mostly sports fields and an outdoor rink (tennis courts in summer) and is bounded by a high school on one side. Right next to the playground is the Sunnydale outdoor rink changehouse The changehouse has washrooms but according to the staff at the tiny playground wading pool, the washrooms are not available to playground users in summer. The immediate neighbourhood is mostly one-storey 1960's era houses separated by well-cared-for gardens. On August 18, there was still a plastic fence around the new playground but a few families were inside. 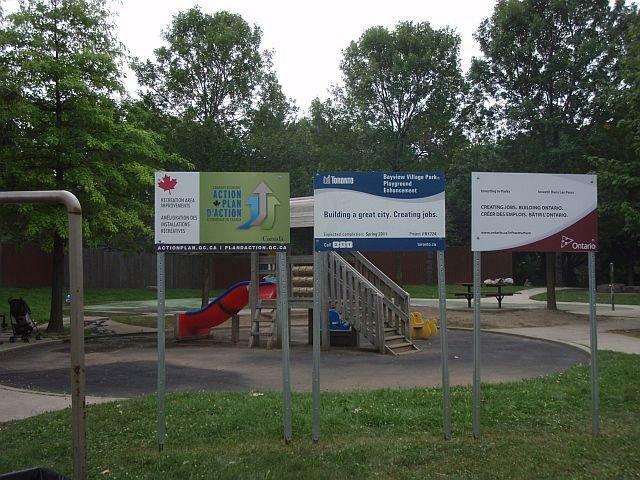 The playground is designed to be accessible to children of varying mobility (engineered wood fibre surface, accessible swing) and to blind children (Braille signage). There is almost no shade, but there are two benches to sit on. 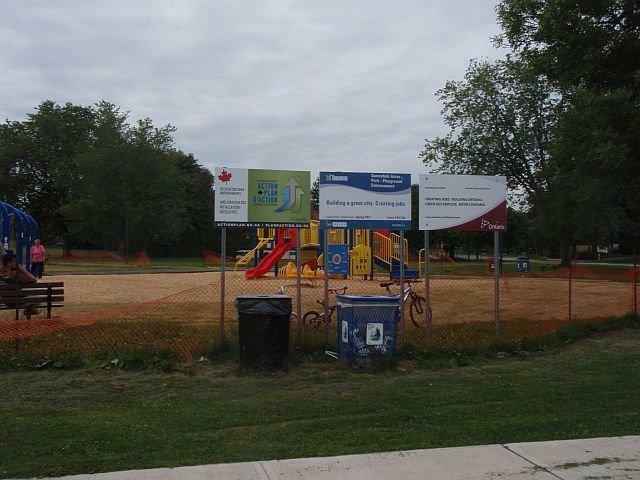 This playground was still being sodded, by the M and M Landscaping Company from Cambridge, Ontario. The fence was still up and it looked as though the wood shavings had just been added. 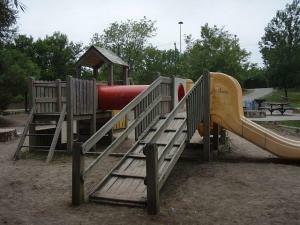 This is a Playpower playground, marked as coming off their line on January 7, 2010. It is accessible for children with mobility problems (walkways, wood fibre, disabled swing) and children who are blind (Braille). 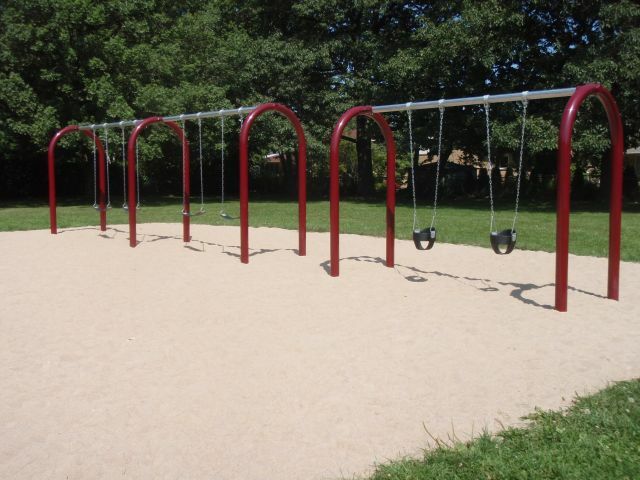 There are only three swings (one of each kind), and although the equipment claims to be for 5-12 year-olds, it's hard to imagine any children that old using it. The neighbourhood has major hydro lines running through it, about a block away. It's surrounded by major traffic arteries on three sides, but they're out of sight from the park. About half the dwellings are one-story houses with well-kept yards. There are three big high-rises at the end of the street, with a playground of their own, as well as a four-hoop basketball court. In between the new playground and the high-rises, there's a large city-run daycare that looks like a social-service agency. 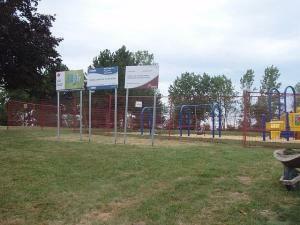 August 16, 2010: The playground's older structure is still in the playground (but the date/manufacturer label has been removed), and a newer one seems to have been added recently. Moss Park also has a splash pad, which worked poorly almost from the beginning and still works poorly now. On a sunny Sunday afternoon in August, there were no children in sight. Four rough-looking adults were sitting in the shade by the wading pool, and three pigeons were sitting on the new wood-fibre surfacing underneath the new playground structure. Aug.10 2010: This playground appears to be in very good shape, with an unusually large and varied number of wood-and-plastic structures. 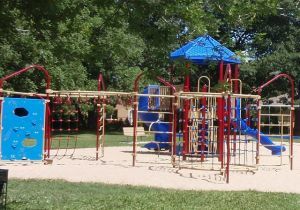 The playground, bought from "Children's Playgrounds" (now owned by Henderson) could not be described as having "low play value." 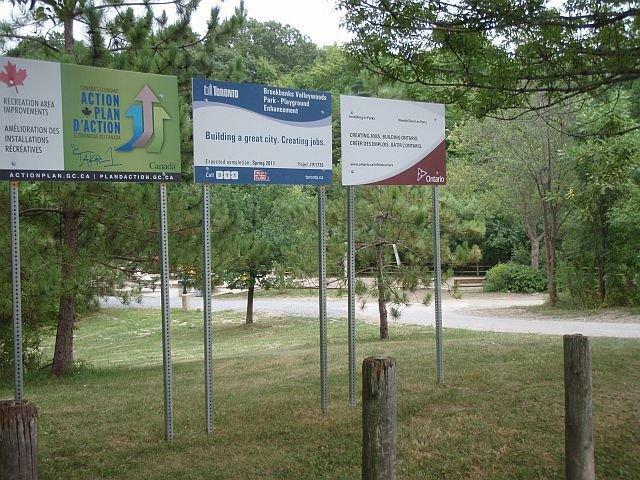 Park users, when asked what they knew about the stimulus project signs, were unaware that it had any relationship to the playground. Some said that the signs were only for advertising. 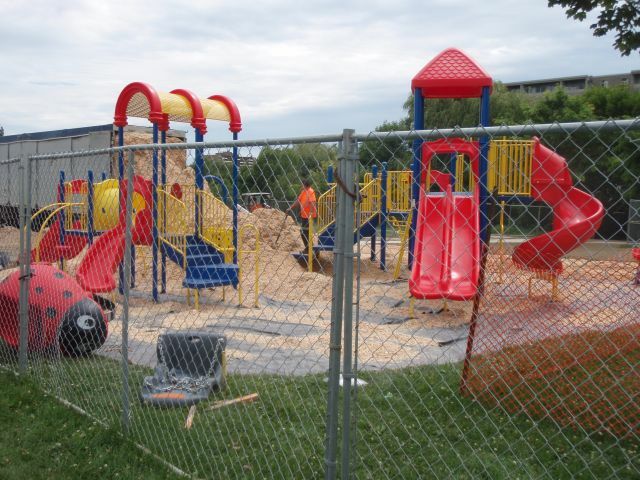 Others said that the project was surely only meant to address a small number of repairs, such as the water leak from the splash pad over to the junior climber. 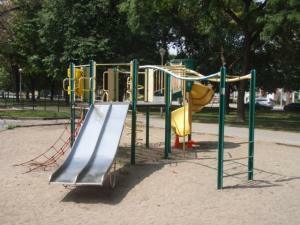 Oct.21 2013: a miracle: this excellent playground was not demolished after all. It was not replaced by a generic plastic structure. 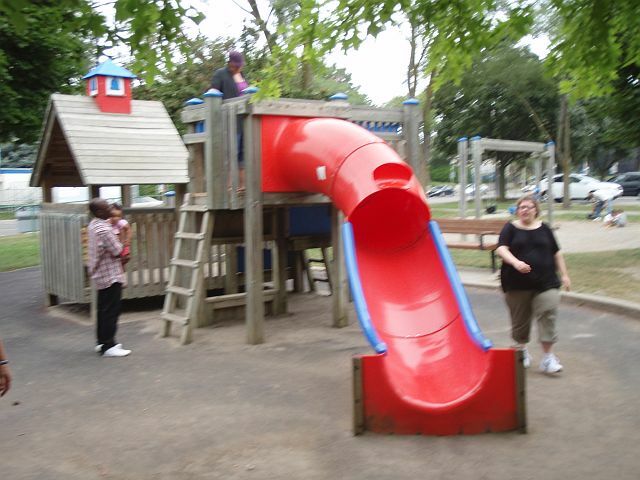 The "stimulus" signs are gone but all the many good elements of the playground are still there. There are a few small changes, notably the resurfacing of the defective splash pad which used to spill water onto the junior structure. A few small repairs would make this playground perfect -- new chains to replace the rusted ones on the rings (but they still seem solid), and a bit of paint. Astonishingly, the final cost to do what appear to be fairly small changes was almost double the budget. The budget was $95,000, the final cost was $179,800 (see above). And still the chains are rusty! 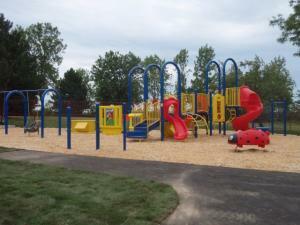 August 21, 2010: The playground is brand new. On a hazy but warm August afternoon, there were three nannies/babysitters and two dads in the park with very young children. The equipment is from Gametime (Alabama), and it labels some of the structures for ages "5 to 12," but it seems unlikely that kids that old would use them much. The playground is wheelchair-accessible with a special swing, wood-fibre surfacing, and asphalt paths near the equipment. No washrooms, but very close to Eglinton (across from the subway entrance), so it may not be too hard to find a place with a public washroom. The park is a centre for a local voluntary fruit growing and gardening group called Growing for Green (their very informative website is communityorchard.ca). This park is in a beautiful location, with really bad maintenance. 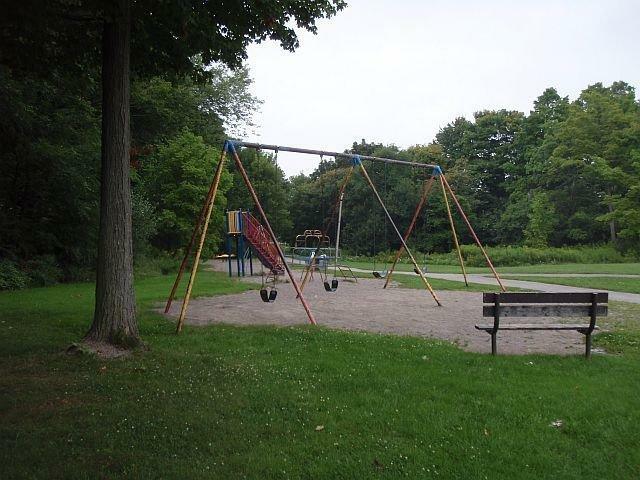 The swings have only the rusted frame, no swings. The wood part of the structure has aged well but the plastic has been bleached by the sun and it looks cheap (although still quite solid to the touch). Picnic tables and benches need wood and nails. At the same time, the "bones" of the park are good and there are wonderful paths leading into the woods and along a spring runoff waterway. Children must have had great adventures playing there, over the years. The park is part of a bigger ravine system and a bit remote -- it wasn't obvious where playground users could park to get there, on weekdays when there's no parking along the road. This oddly-shaped has no street frontage at all. 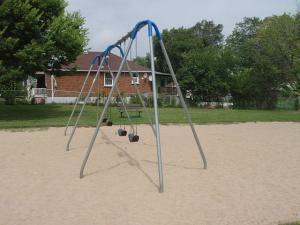 It also has almost no playground equipment (only one set of swings and a basketball court). But there are some apartment buildings nearby and a school on one side, so it's easy to imagine some kids wanting to play. However, on a sunny August day at about 1 pm, there was no one on the swings, nor on the basketball court. The whole park has only three benches, plus two more on the basketball court. Hopefully the new playground will have more places for park users to sit. There are nice trees but none near the play area. How the park looked before renovation May 2 2009. Sept.4 2010: This park is the width (and depth) of two houses. 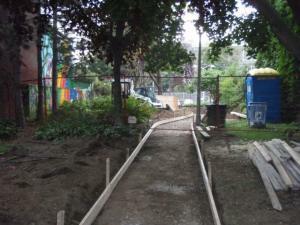 A curved cement walkway has been poured. 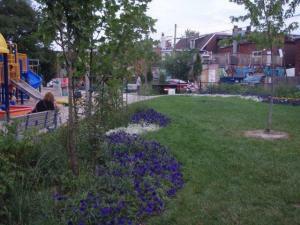 As of September 4, the park looks complete (i.e. 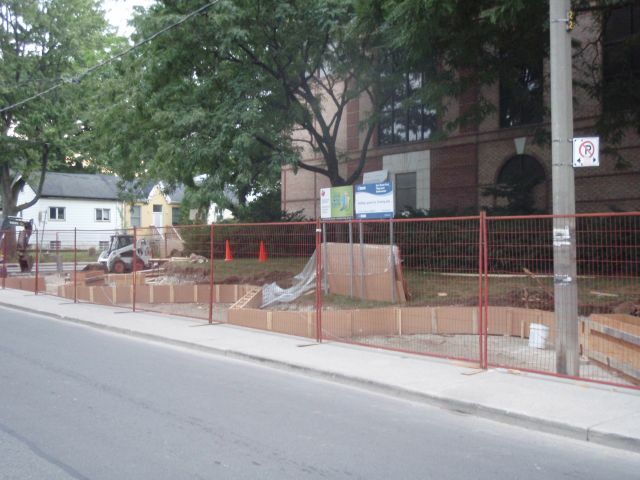 fully landscaped) but without the features listed in Councillor Vaughan's newsletter (see below). A puzzle. 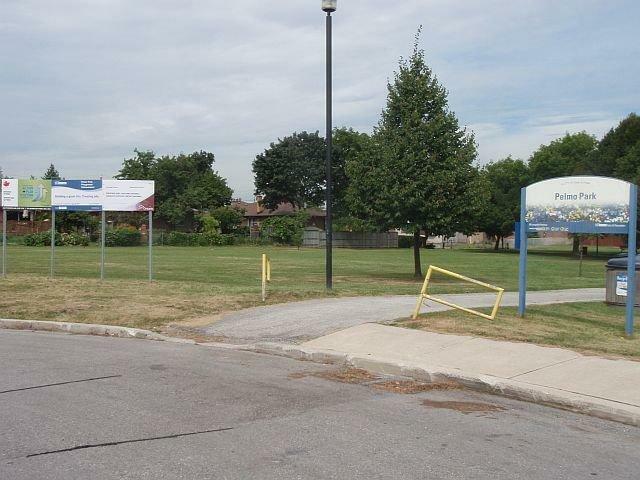 The councillor's website still has the pre-reno information on it: Park was named in 2005 for Sally Bird who was a local resident who was active in improving her community and was instrumental in having the parkette created on the former site of an auto body repair shop. 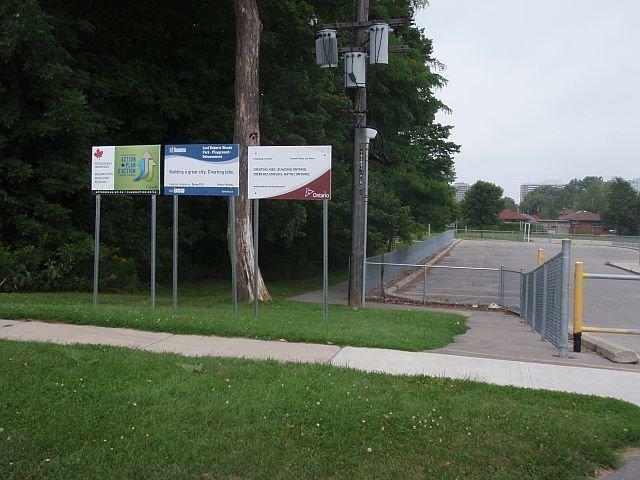 April 12, 2014: This park looks long finished but it didn't get all the things that were promised -- the waterplay features seem to have been replaced by a rather imposing black metal fence with double gates leading in from the laneway. A blogger discovered the park by accident and wrote this. August 12. 2010: This was a tiny playground that is in one of the smallest parks in the city -- really just the edge of a building lot. It will be interesting to see how $100,000 can be spent there. The small toddler playground has been removed, leaving only the drinking fountain standing. Concrete curved low walls are being poured. 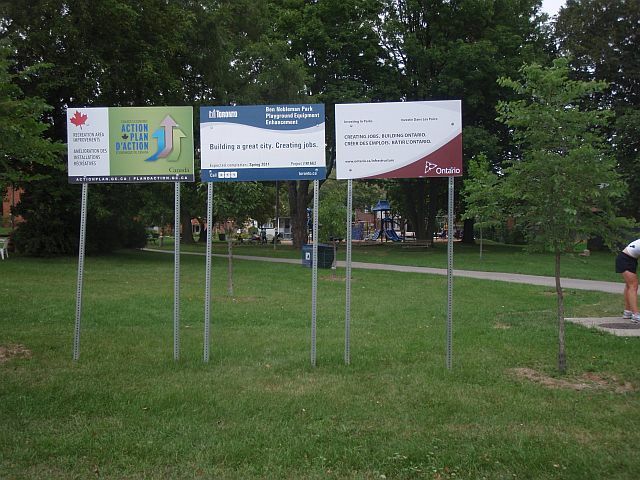 September 4, 2010: it's done, and it went almost $20,000 over budget. The main cost appears to have been the construction of the little retaining walls. May 17 2013: the CBC reported that an outdoor gym in Dartmouth N.S., bought from the same company, had to be removed because pieces were breaking. By then the company had folded. This playground has a large expanse of new sand, which looks as though it was added very recently and probably cost about $20,000. The other notable feature is the almost total absence of shade. On a hot sunny August afternoon, this meant that the kids playing there stayed under the equipment or over on one edge where there was a small areas of shade. 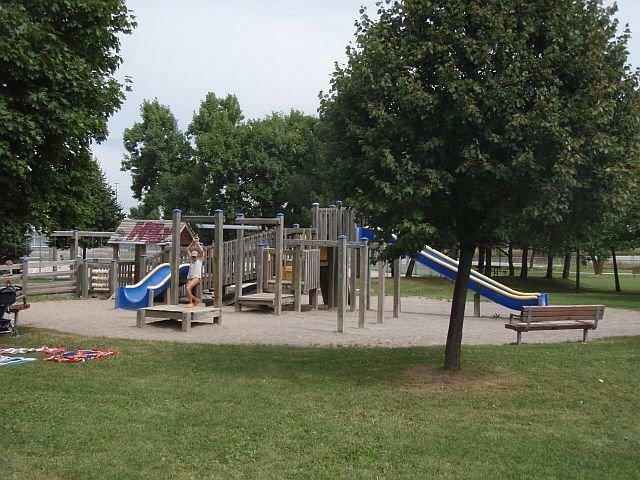 Although the playground work excel sheets we received through freedom of information are not clear on dates, one of the slides says "Paris Playgrounds, 2000," (by then owned by Little Tikes/Playpower) which would mean that this playground is set to be replaced after only 10 years. the current playground, no shade! 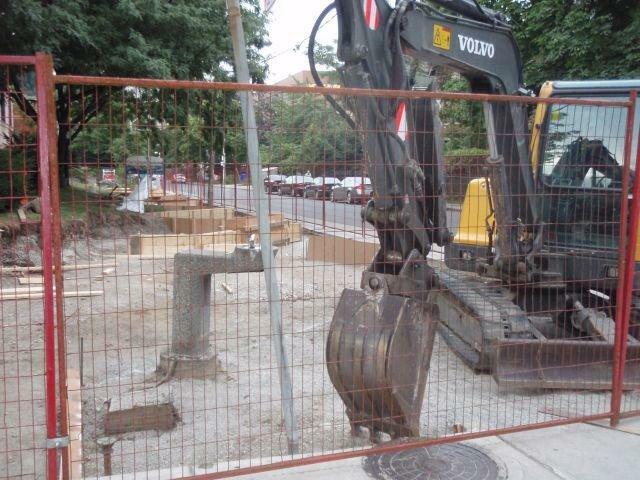 August 13, 2010: This playground project is hard for a visitor to figure out. 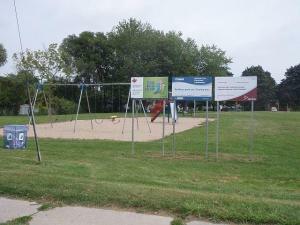 The Stimulus Funds list gives Edithvale as two separate playground projects, for $100,000 each. But only one small playground is visible at the moment (photos below). 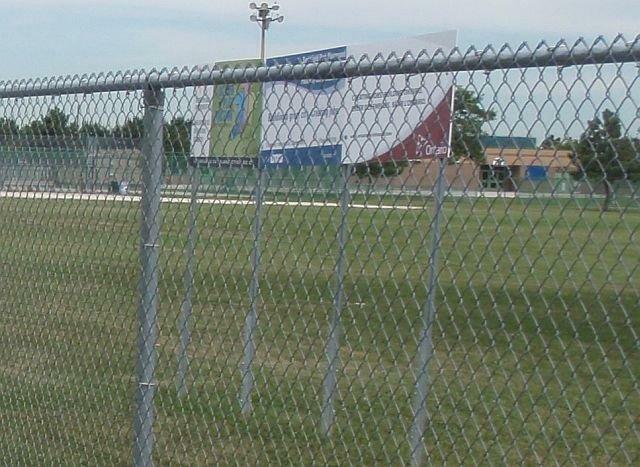 There is a construction fence around part of the park because of the ongoing Edithvale Community Recreation Centre construction. The large playground pictures in the 1999 inspection reports may have been within the current construction fence -- but there's only an empty spot now. 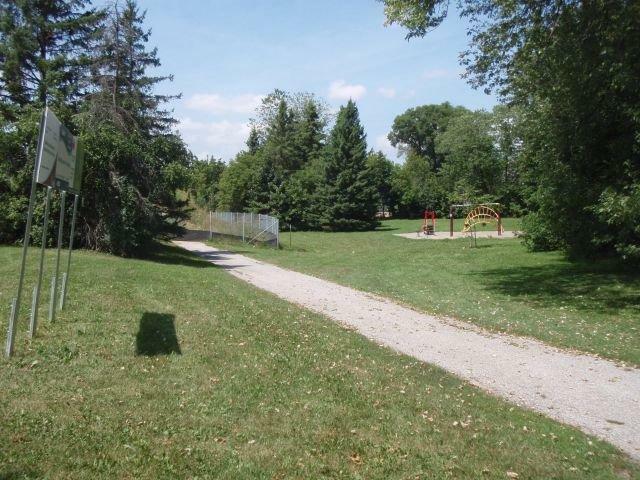 Most of the park is long and narrow, following a spring run-off watercourse that passes between sixties-era one- and two-story houses (some evidently replaced recently by larger houses that go almost to the property lines). On a hot, sunny August afternoon, there was only one person -- a dog-walker -- in the whole long park. The park has no washrooms and almost no benches. Blue Imp equipment -- to be replaced? 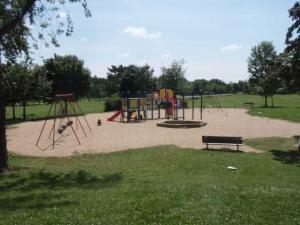 We could find no playground in the south of this park, and the 1999 inspection report shows no photos. 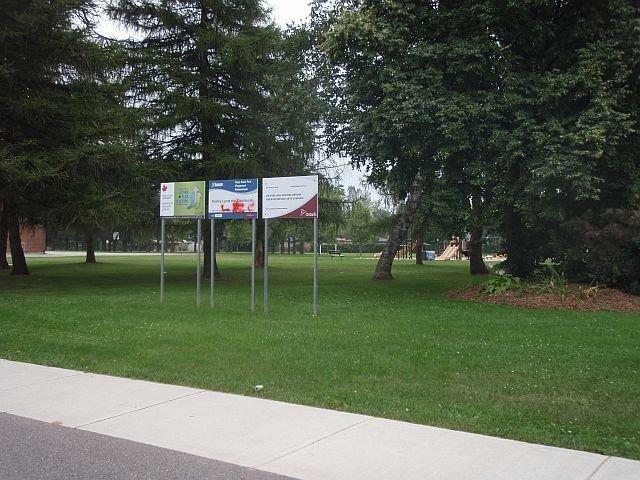 This long park also has no washroom and almost no benches. It looks like the Edithvale South allocation was transferred to Edithvale North, maybe as the Berliner Seilfabrik climber, which is actually to the immediate east of the other Edithvale North playground sections. 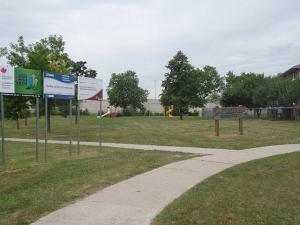 The really nice thing is that at the south end of the sports field, the original swings have been left still there. 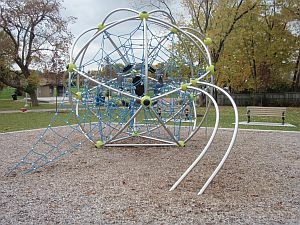 This playground structure was manufactured in December 2009 by Belair Recreational Products, in Paris Ontario. 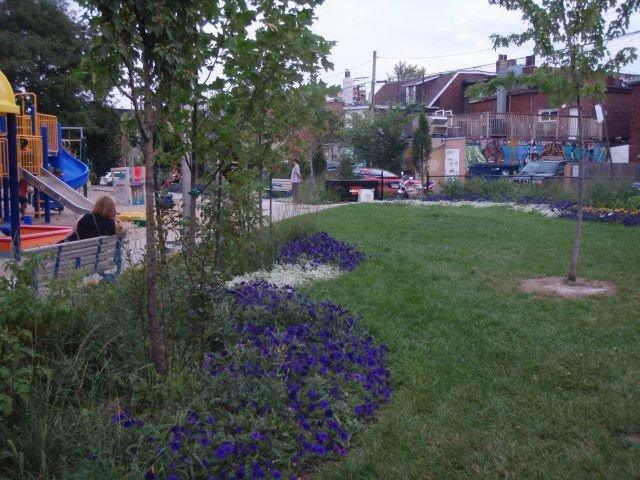 Irene Parkette is quite small (on top of the subway lands) but it's been ingeniously designed to have space not only for the new playground equipment but also for new trees and flowerbeds. It's unlikely that there will be funds to maintain the flowerbeds after the first year, but they look very nice now. No washroom, and no waterplay. A small, flat park in a neighbourhood of small one- and two-story houses. At the far end of the neighbourhood, along Midland Agvenue, there are some high rise apartments. Most of the park is a baseball diamond, with the playground located kitty-corner so that there may be some danger from out-of-bounds baseballs. The playground is two swing sets, a Blue Imp slide and a jiggly bug, in a vast expanse of new deep sand. On this sunny Sunday afternoon in August, there was no one in the park. 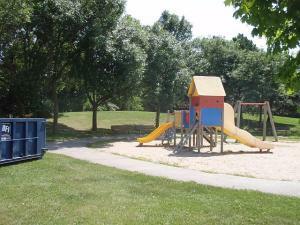 Lessard Park is a small neighbourhood park on the ridge above the Humber River. It's surrounded by expensive houses, and on a sunny August afternoon, most of the caregivers at the playground were Filipino nannies. 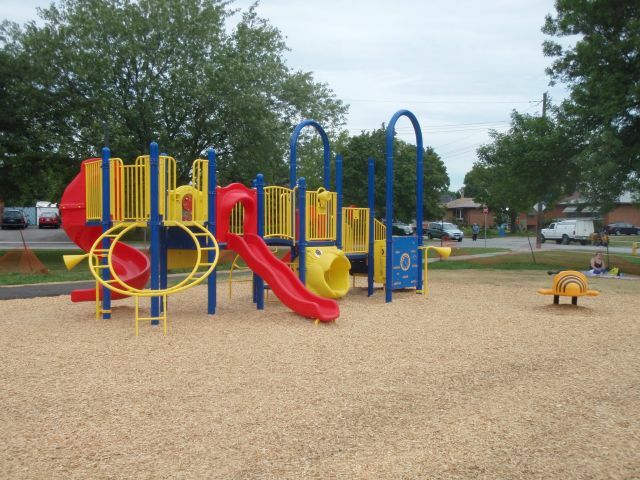 The playground, from Bryan Belair's KSL Company in Brantford, is accessible for wheelchairs (wood chip base and disabled swing, accessible lower play areas). Aside from new benches at the playground, there are no other benches in the park. 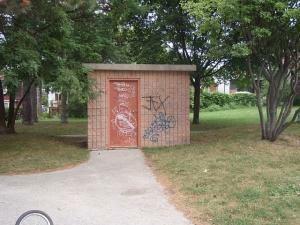 There's one brick storage building covered with graffiti, but no washroom. One picnic table, in need of paint. One of the mothers at the playground said the previous structure was wooden and that it was not in good repair: "there were loose screws." She said there were some meetings but she had not been able to attend. An article by Lisa Rainford in the Villager newspaper said there was a meeting in May, attended by about 20 people. Rainford quotes City Councillor Bill Saundercook saying that the former wooden structure was "archaic by today's CSA standards." 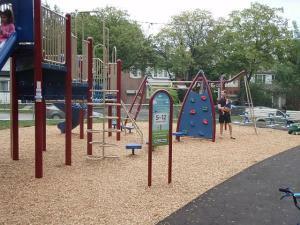 August 13, 2010: This playground is in a neighbourhood of mainly one- and two-story houses on large lots. There is a gated high-rise enclave to the west. On a hot, sunny August afternoon, there was no one in the park. 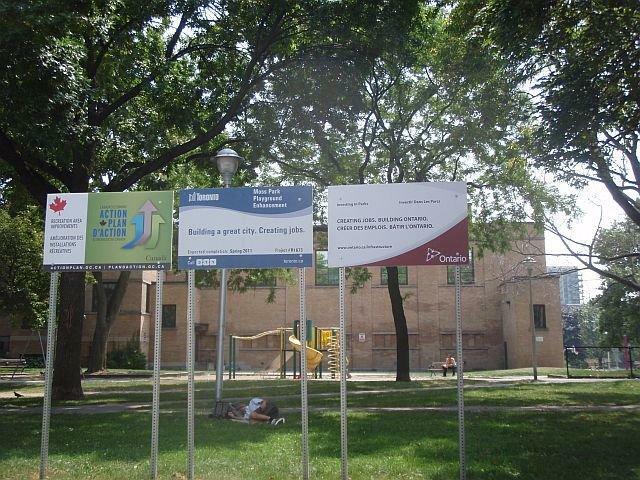 There are no washrooms, no shade at the playground, no water, and few benches. However, there is one new picnic table. The playground is not wheelchair-accessible (deep sand surfacing, no accessible features e.g. swing). The equipment contract went to Henderson. 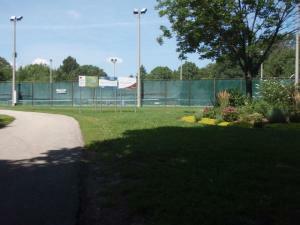 There is a tennis club and a large decorative flowerbed at the south entrance, and the park is well-kept. 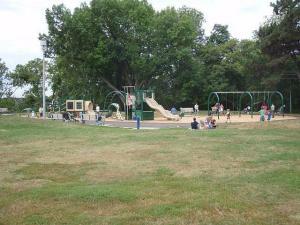 On a sunny August day, the playground, famous for its lion slide, was filled with kids. 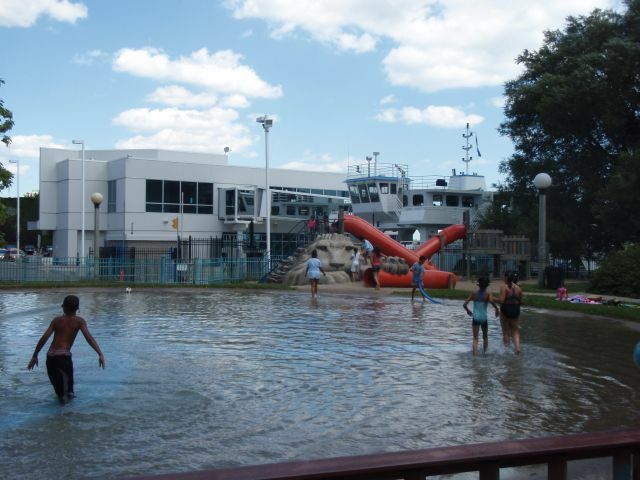 The wading pool is integrated with the rest of the playground, and there's a good-sized change area with clean washrooms. The airport ferry has its dock right beside the large lion-slide, so there's plenty of action for kids to watch. This playground was designed by an architecture firm (twenty years ago?) and some of those features are either broken or gone. (Some pieces were removed during the CSA Program purge in 2000.) The maze is unused and there's a mystery structure that looks a bit like metal palm trees, broken for years. There was a little amphitheatre with a storytellers' chair. The chair rotted and was removed several years ago. 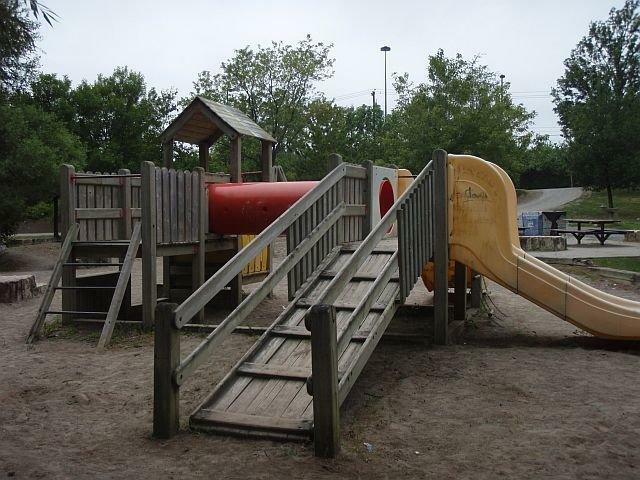 But despite the poor repair, the playground continues to be popular. It is fairly well shaded. 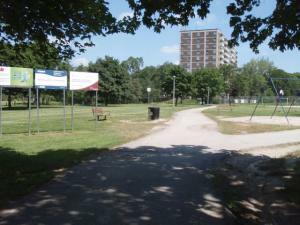 August 15, 2010: The park is a little piece of forest near railway tracks, a high-voltage power corridor, north of Eglinton between Kennedy and Midland Avenues. The neighbourhood is mainly one-story 1960s-era houses. The park backs onto houses but is so close to thick woods that when it is deserted -- as it was on a sunny August Sunday -- it can be a bit frightening for a visitor. No washrooms, nor water. But there is shade, and the paths into the woods look like they may be fertile roads to children's imagination. 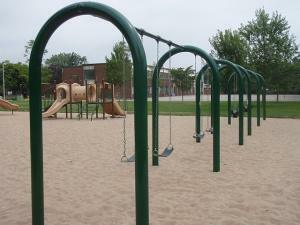 The original belt-swing frame is there but the number of swings have been reduced from six to four. The chains are still long enough that swinging could be fun. One of the original Metal Paris Playgrounds climbers is still in the playground, plus a newer Blue Imp slide that's common in Scarborough. This playground is at the moment just an empty patch of sand at the very edge of a park dominated by an open baseball field. The sand has recent tractor tires in it. Right next to the playground area is a primary school, not separated by a fence. Further back in the schoolyard, a very large new playground set is also just being installed. 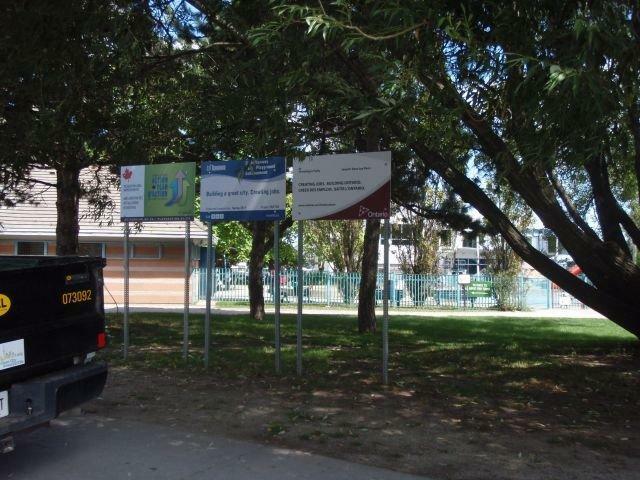 The playground and the sports filed are separated by some very fine evergreens. 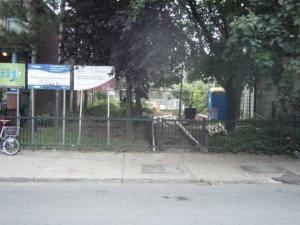 August 10, 2010: This playground is not far from Pelmo Playground, at the tip of a dead-end street, backing onto mostly two-story houses, and some low industrial storage buildings. There is some tree planting, relieving the otherwise dreary park landscape. The play equipment, such as it is, is very poorly maintained (rusty) but solid. 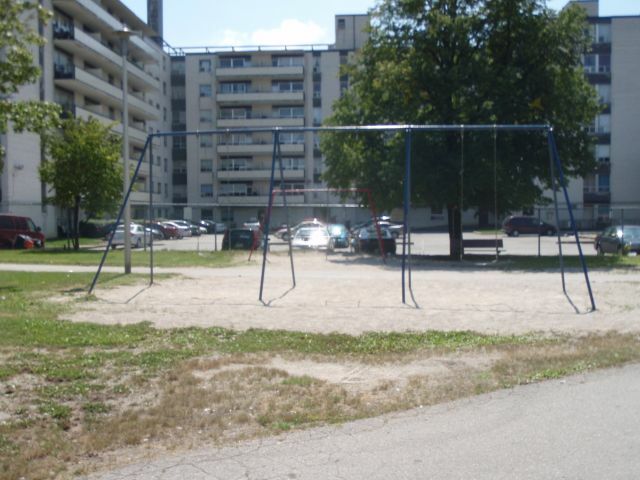 This is one of the only city playgrounds that seems to have had no sand added. 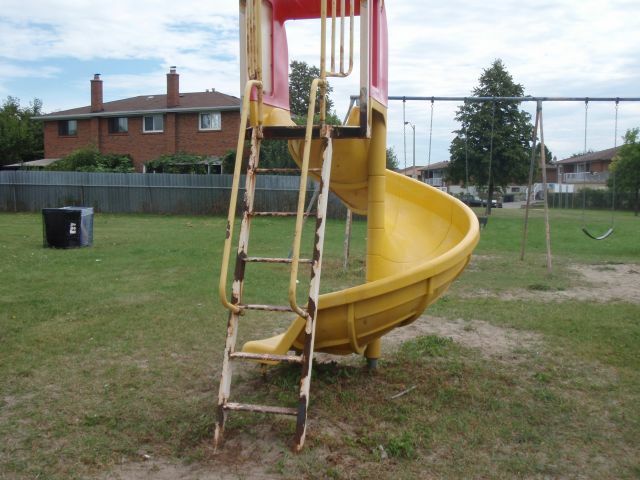 It also has a Paris Playgrounds climber in it, a good old 1960s antique that is now seen only in forgotten, out-of-the-way parks. It's hard to know where the kids would come from, who will play here, since the park is so small, plain, and out of the way. On a hot, hazy August afternoon, no park users were in sight. This is one of the few city playgrounds that was not taken out in the last big wave of playground removals (CSA replacement program, 2000 - 2003). It's almost identical to how it was in 1999, and it has stood up very well (plastic components included). 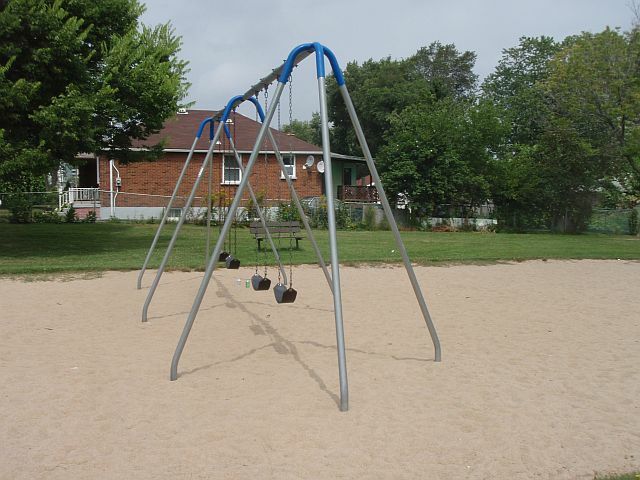 The playground equipment is from "Children's Playgrounds" (Peterborough) which was bought by the Henderson company when it fell on hard times. The City's playground maintenance shows over $8,000 repairs made to the playground between 2000 and 2004, but it's hard to see where -- the 1999 photos and the current ones seem pretty much the same. On a hazy August afternoon, there were tennis players on the tennis courts, plus one small day camp in the playground, eating their lunch. 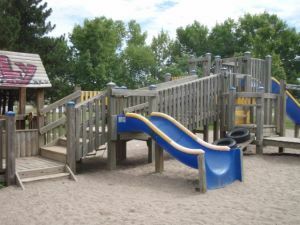 There's a single splash-source next to the playground, but it looked as though as the kids had been playing there, and had draped their towels over one of the playhouse walls. They looked very much at home in the playground. solid "Children's Playgrounds" structure, to be removed? This playground is manufactured by Playpower, a large transnational manufacturer which has a Canadian dealer in Paris, Ontario. The equipment label gives the date of manufacture as April 2010. At 12.30 on a hazy, hot Sunday, there were no children at the playground -- just one elderly woman sitting on a swing. 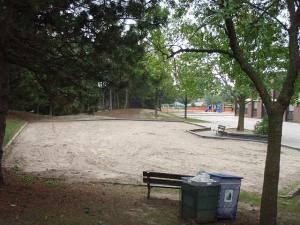 The surfacing is deep sand, and there is no accessible swing or other notably accessible feature. The playground is beside a school. 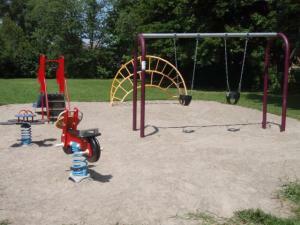 The sign on the equipment says the playground was installed in 1994. 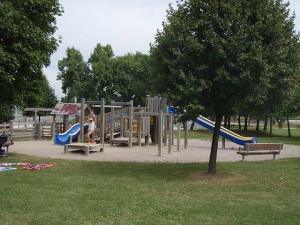 At 2 pm on a hot and sunny August afternoon, the playground was empty. The park was tidy but the playground and the park furniture show very poor maintenance -- rusty rivets and lack of paint. The neighbourhood is mainly one- or two-story houses with some very large replacement homes, and a gated apartment complex not far away. 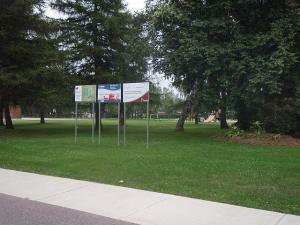 This is a very large park, with sports fields. There is a middle school along the north side. On an August afternoon, most of the playground had been installed and a Fibertop truck was just delivering a huge load of wood shavings for the surfacing. Two Hank Deenen landscaping trucks were waiting for their chance to lay sod. 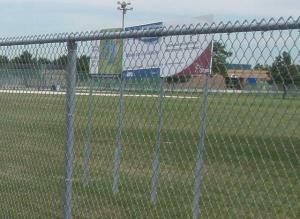 Five people including three children were watching, outside of the construction fence. 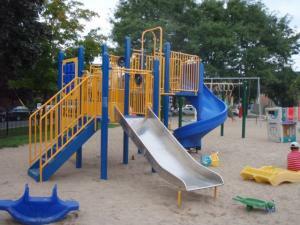 The playground seems to be a Playpower structure. The area is mostly one or two-story houses, with some low-rise apartments -- lots of East Indian people on the street.